Klasies River is the collective name of several caves eroded into the sandstone bluff located along a 1.5 mile (2.5 kilometers) stretch of the Tsitsikamma coast of South Africa facing the Indian Ocean. Between 125,000 and 55,000 years ago, a handful of our Anatomically Modern Human (AMH) (Homo sapiens) ancestors lived in these caves at the very southern tip of Africa. What they left behind provides evidence of the behavior of Homo sapiens at our very earliest moments of existence, and a slightly uncomfortable peek into our distant past. The Klasies River "main site" is one of the most intensively occupied sites within this area, associated with abundant cultural and subsistence remains of Middle Stone Age (MSA) hunter-gatherer-fishers. The site includes two caves and two smaller rock shelters, tied together by a 69-foot (21-meter) thick shell midden that spills out of all four. Archaeological investigations have been conducted at Klasies River since the late 1960s, primarily at the main site. 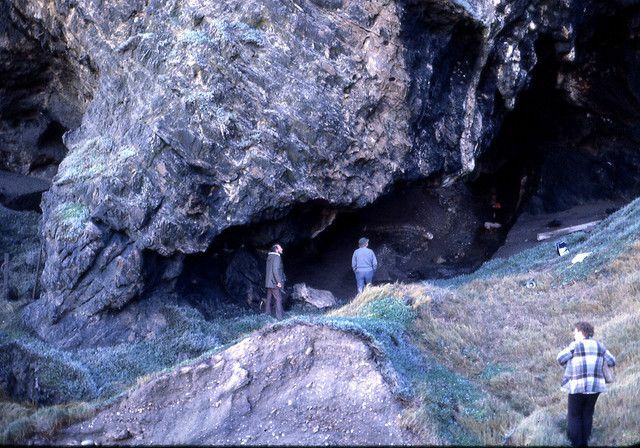 The Klasies River caves were first excavated by J. Wymer in 1967–1968, and then by H. Deacon between 1984–1995, and most recently by Sarah Wurz beginning in 2013. Early modern Homo sapiens lived in the Klasies River caves during the Middle Stone Age, periods which are roughly equivalent to the Marine Isotope Stage (MIS 5). At Klasies, MSA I (MIS 5e/d), MSA I Lower (MIS 5c), and MSA I Upper (MIS 5b/a) were relatively intensive human occupations. The oldest the oldest AMH bone found in the cave dates to 115,000 (abbreviated 115 ka). The main layers of occupation and listed in the table below; the most substantial occupation debris is from the MSA II lower levels. Artifacts found at the sites include stone and bone tools, animal bones and mussel shell, and over 40 bones or bone fragments of the human occupants of the cave. Hearths and artifact clusters within the shell midden indicate that the residents systematically exploited both land-based and marine resources. Animal bones found within the caves include bovids, baboon, otter, and leopard. The earliest stone tool tradition found in the caves is MSA I Klasies River techno-complex. Others include convergent Levallois tool types in MSA I known as Mossel Bay technocomplex; and the Howiesons Poort/Still Bay complex. Nearly 40 human fossil bones and bone fragments are in the catalogs from the excavations. Some of the bones look identical to modern Homo sapien morphologies, others show more archaic traits than recent human populations. The people who lived in these caves were modern humans who lived by recognizably human methods, hunting game and gathering plant foods. Evidence for our other hominid ancestors—Homo erectus and Homo ergaster, for example—suggests that they primarily scavenged other animal's kills; the Homo sapiens of Klasies River caves knew how to hunt. The Klasies River people dined on shellfish, antelope, seals, penguins, and some unidentified plant foods, roasting them in hearths built for the purpose. The caves were not permanent residences for the humans who inhabited them, as best as we can tell; they only stayed for a few weeks, then moved along to the next hunting stand. Stone tools and flakes made from beach cobbles were recovered from the earliest levels of the site. Apart from the debris of living, researchers have also found fragmentary evidence in these earliest levels of the earliest of ritual behavior—cannibalism. Fossil human remains were found in several layers of the Klasies River occupations, fire-blackened fragments of skulls and other bones showing cut marks from deliberate butchery. While this alone would not convince researchers that cannibalism had taken place, the pieces were mixed with the rubble of kitchen debris—thrown out with the shells and bones of the remainder of the meal. These bones were unequivocally modern human; at a time when no other modern humans are known—only Neanderthals and early modern Homo existed outside of Africa. By 70,000 years ago, when the layers called by archaeologists Howieson's Poort were laid down, these same caves were used by people with a more sophisticated stone tool technology, backed tools from thin stone blades, and projectile points. The raw material from these tools came not from the beach, but from rough mines some 12 mi (20 km) away. The Middle Stone Age Howieson's Poort lithic technology is nearly unique for its time; similar tool types are not found anywhere else until the much later Late Stone Age assemblages. While archaeologists and paleontologists continue to debate whether modern humans are descended only from the Homo sapiens populations from Africa, or from a combination of Homo sapiens and Neanderthal, the Klasies River cave populations are still our ancestors and are still representatives of the earliest known modern humans on the planet. Bartram, Laurence E.Jr., and Curtis W. Marean. "Explaining the "Klasies Pattern": Kua Ethnoarchaeology, the Die Kelders Middle Stone Age Archaeofauna, Long Bone Fragmentation and Carnivore Ravaging." Journal of Archaeological Science 26 (1999): 9–29. Print. Churchill, S. E., et al. "Morphological Affinities of the Proximal Ulna from Klasies River Main Site: Archaic or Modern?" Journal of Human Evolution 31 (1996): 213–37. Print. Deacon, H.J., and V. B. Geleisjsne. "The Stratigraphy and Sedimentology of the Main Site Sequence, Klasies River, South Africa." The South African Archaeological Bulletin 43 (1988): 5–14. Print. Grine, Frederick E., Sarah Wurz, and Curtis W. Marean. "The Middle Stone Age Human Fossil Record from Klasies River Main Site." Journal of Human Evolution 103 (2017): 53–78. Print. Hall, S., and J. Binneman. "Later Stone Age Burial Variability in the Cape: A Social Interpretation." The South African Archaeological Bulletin 42 (1987): 140–52. Print. Nami, Hugo G., et al. "Palaeomagnetic Results and New Dates of Sedimentary Deposits from Klasies River Cave 1, South Africa." South African Journal of Science 112.11/12 (2016). Print. Nel, Turid Hillestad, Sarah Wurz, and Christopher Stuart Henshilwood. "Small Mammals from Marine Isotope Stage 5 at Klasies River, South Africa–Reconstructing the Local Palaeoenvironment." Quaternary International 471 (2018): 6–20. Print. Voigt, Elizabeth. "Stone Age Molluscan Utilization at Klasies River Mouth Caves." South African Journal of Science 69 (1973): 306–09. Print. Wurz, Sarah. "Variability in the Middle Stone Age Lithic Sequence, 115,000–60,000 Years Ago at Klasies River, South Africa." Journal of Archaeological Science 29 (2002): 1001–15. Print. Wurz, Sarah, et al. "Connections, Culture and Environments around 100?000 Years Ago at Klasies River Main Site." Quaternary International (2018). Print. Should archaeologists ditch the Mousterian category of stone tools?